Well, I'm still a newb gardener.. but I'm at least learning a bit more this year! I thought i'd post some photos of how my stuff is doing, as I'm just sort of feeling my way around like everyone else-- i've made a few bad decisions here and there, but, hey, maybe someone else can learn from my mistakes/experiences too? Photos of my garden included at the bottom... as you can see, I bought a little bit too much hay. I have the pictured leftover, along with a totally other whole bale! whoops! 2. Always trellis, support, or cage the tomato plant immediately after planting. Don't go in with the attitude that you'll take care of it in a few days... now my container tomato is WAY too big for me to be able to do anything with, I'm going to have to jury rig something up for that huge plant. It's already got little green tomatoes on it. 3. 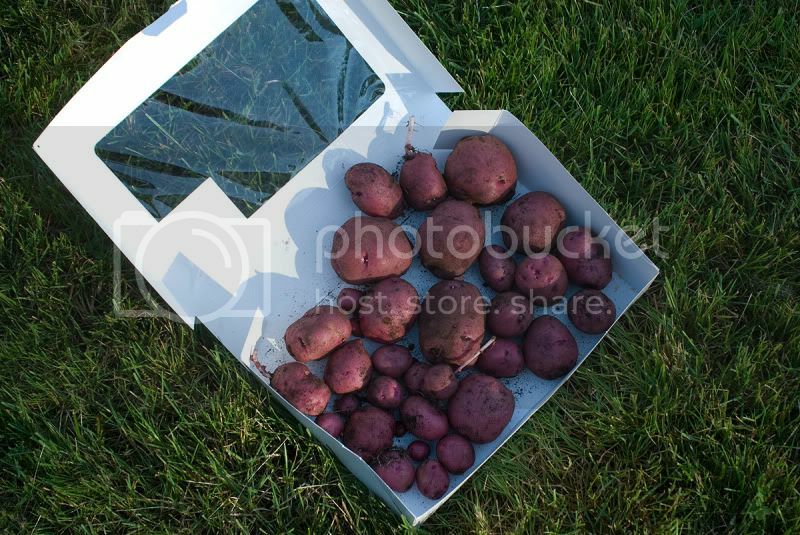 Potatoes work out great in containers, BUT... for blight purposes (i've got a little bit of late blight that i've been fighting with them) i wouldn't put containers with the same type of plant next to each other, and would spread them out a bit more. Unfortunately, these are too heavy for me to move right now! 4. The blue containers are on sale at home depot for 5.97, just drill a few holes in the bottom for drainage and they make AWESOME planters, even for larger plants such as Zucchini! 5. Bugs love to eat pepper & Lima bean plants. Slugs too. Protect them as much as you can! 6. Soil temperature really does make a difference. Keep an eye out on that. 7. Keep up on weeding, i neglected my garden a bit because it was raining so much. I came out and had quite a few to pull! 8. Mushrooms are OK, they'll go away soon enough. 9. Everything will flower, both male and female, you just have to give it time! As much as I wish it otherwise, it won't grow while I'm staring at it, all day! 11. If you have a small garden like i do, one bale of hay is enough. Really. Don't buy two- just by one. It'll give plenty. 12. Space planning. It helps. I went all hodge-podge this year, but I'm not sure if i could call it a success or not. Guess i'll have to see at the end of the year! 15. If a crop isn't working out, just go ahead, pull it, and try something else. It never hurts to be adventurous! 16. Plant what you'll eat, and Plant in a quantity that you can manage~ this has been my biggest mistake... i planted too many tomatoes and too many zucchini. I could have used 2 or 3 of those plant spaces for another type of plant, which i don't' really have room for. 17. Take advantage of max space, by using both in ground and container gardening. It helps to have both, i've found! 18. Bug spray (on you, not the plants!) will be your best friend. a hat helps too. With the straw laid down... i've got a TON of extra. I had a strawberry bed, but decided to pull them since production slowed down, and I wanted room for my pumpkin plant to sprawl. Monster container tomato. This is the one I forgot to trellis/support. Notice how the tomato plants in the garden (same kind) are growing perfectly in sync with the cages? Well, this plant had some other ideas! Container Pepper and garlic in front, Lima beans behind, climbing on the tomato cages i gave them to wrap around. My one currently producing container Zucchini, the fruit there is going to be picked this weekend! Container potatoes, starting to flower. One of the plants is starting to die, but i keep having to remember that, with potatoes, the dying back is OK! It means i'll end up with potatoes! Not too bad of a garden. Everything you said is the truth. You are coming along quite nicely. Remember there is so so much to learn about gardening you can be a master in on year or even 10 years. I have been gardening in a small fashion for a long time, I have just recently ramped up my exploits. I feel every year like it is my first time. Keep it up and stay tuned you will learn more than you ever thought possible. :Edit: looking back at your pics is that powdery mildew on your zucs? If so a milk spray or Neem can help with that. Gixx - look at the first zucch picture, the one right below the peppers and garlic picture. See how the silver follows all the veins? That's not powdery mildew. Lots of zucchs have silvery veination like that. It's all looking GOOD! You've done great for a first timer SP and learned a lot of good lessons. We all keep learning all the time. Last year I made a similar post about lessons I learned from the experience, and I've been gardening more than 20 years! (I don't have time to go looking for it right now, or I would link it). gixxerific wrote: Not too bad of a garden. Thank you! I'm so ecstatic. I've eaten things from my garden for the first time last night- so excited! I know I have a long way to go, and learn, but at least I'm headed in the right direction! Going to even try for a fall/winter garden this year if i can manage it. Re: the coloring on the zuccs, i was freaking out for a while too, especially since I saw 2 cucumber beetles hanging around, and some potato beetles on the potatoes next to them, but it seems to be doing okay and it's on all the leaves, so I decided to leave it be. So far so good! rainbowgardener wrote: Gixx - look at the first zucch picture, the one right below the peppers and garlic picture. See how the silver follows all the veins? That's not powdery mildew. Lots of zucchs have silvery veination like that. 1) Habaneros are way to hot to eat! I planted one because I like peppers/spicy foods. The first one I tried eating made everyone in my house's eyes water. They were on opposite sides of the house too! For me cutting it, I couldn't stay in the room after the first slice. The one plant I planted must have yielded close to 100 peppers (not exaggerating either) I threw probably all but 90 in the compost bin! 2) If you are planting next to a large barrier (the side of my house in my case) be very cognizant of plant spacing! If you plant too closely (like I did) you will be fighting off powdery mildew all summer (and inevitably losing). 3) Plants love water from rain barrels! I truly believe tap water doesn't come close. 4) Eventho those metal tomato cages look newbish, they are so much easier than staking! 5) Why didn't I make my garden a lot bigger!!?? "Look noobish?" haha... never even thought about looks in my veggie garden. I just wanted veggies. Looks like you got a nice garden going there. I'm a newbie too. Here's a few things I've learned so far that we could include on the learning list. Allow enough room in your garden so you are able to turn and move about while you are weeding, etc. I've neglected to do that and am now paying for that. When planting really small seeds like lettuce and carrots do it on a day when it isn't windy. Otherwise those darn seeds end up in places where you didn't want to be. These are just a few things that I have come to learn as I garden. My lesson that I have learned many years now. Try to find a way in my moderate sized garden to plant things, mainly tomatoes, so that when they get crazy I can actually get to them. I'm just sort of feeling my way around like everyone else-- i've made a few bad decisions here and there, but, hey, maybe someone else can learn from my mistakes/experiences too? I am grinning because I have been gardening for a long time, and I still mess up. And a new lesson learned: Never go out to look at the plants in the middle of the day. I freak out because they all wilt from the heat. Your zucchini look great. In almost 50 years of gardening this is the latest I've had summer squash/zuccchini. Not sure what's going on but I've had lots of male flowers but no females for several weeks. We're all newbies at gardening. I think when they coined the term "life long learners" they had gardeners in mind. Your potato caterpillars are probably Colorado potato beetle larvae. They are incredibly voracious so you need to constantly look on the underside of potato leaves for the eggs. Darn things go from egg to adult in 21 days so they can really decimate a crop in short order. BTW, your earlier note about the potatoes having late blight was more likely early blight. Late blight wipes out your plants, potato and tomato, within a day or two. 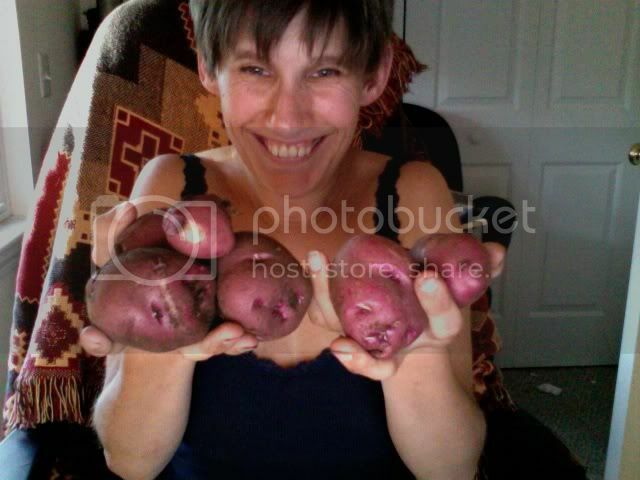 It's really the nastiest of all potato/tomato diseases. 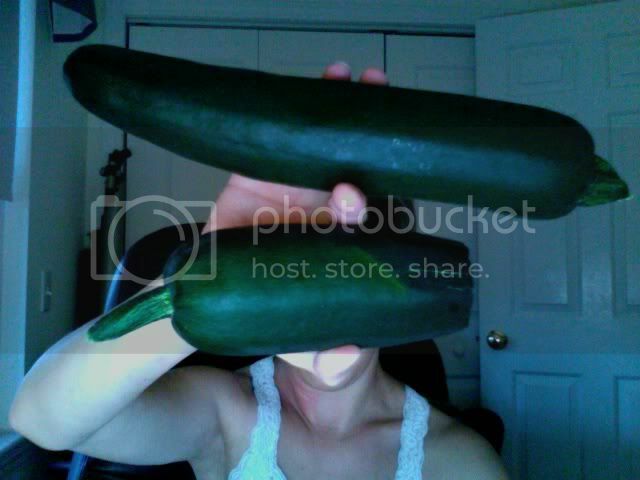 vermontkingdom wrote: Your zucchini look great. In almost 50 years of gardening this is the latest I've had summer squash/zuccchini. Not sure what's going on but I've had lots of male flowers but no females for several weeks. We're all newbies at gardening. I think when they coined the term "life long learners" they had gardeners in mind. I actually have been researching like a maniac to figure out what the heck they were, except they really didn't look like the pictures on google pictures. Either way, I smashed them all and burned the leaves they were on with others . Hopefully that means that my potatoes themselves will be okay, and aren't damaged! Very nice garden and photos. Thank you for sharing. You can teach an old dog new tricks as well as a new dog old tricks. Only harvest as much at one time that you are willing to put up that day. Last edited by DoubleDogFarm on Mon Jul 11, 2011 7:26 pm, edited 1 time in total. Thank you so much everyone! I just up and went for it with everything this year, and so far it's paying off. After mentioning earlier my battle with some Colorado potato beetles, I made the decision to pull one of my potato containers, and try to grow some fall carrots in it.Ã‚Â I was heartbroken, because the plants were pretty much dead and they never bloomed, so i thought i'd have no potatoes. Well, i was wrong. VERY wrong. New Lesson learned: Just cause a plant hasn't bloomed, doesn't mean it doesn't have potatoes! Also, rummaging through the dirt is like a treasure chest. You never know what you're going to find! I have them out drying on the deck on some paper towels- but I'm not sure how to store them, really. I know they aren't really "main crop" potatoes and would count as "new" potatoes, but i'd at least like to hang onto them a little bit longer, as i won't be able to eat this many next week!